Interesting results on the impact of social media on product innovation were revealed in a recent study conducted by the consulting firm Kalypso. The biggest impact reported by 20% of organizations using social media as part of their product strategy is faster product adoption. In addition 16% reported faster time to market and 15% lower product development cost as the biggest impact. 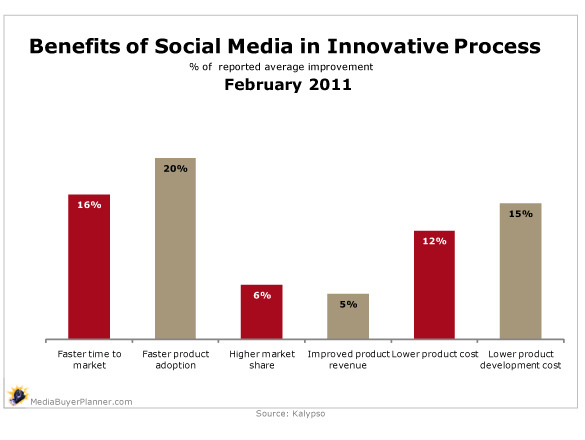 In looking at this graph we can see that the organizations using social media in their product innovation process are gaining in two critical factors: time and costs. Even though the results are definitive many organizations are still struggling to integrate social media into the product innovation process. •	33 percent reported that they have not yet implemented a formal strategy to include social media into the product innovation process. These results indicate that in order to benefit from the positive impact of social media as reported by the Kalypso studies, organizations need better education on which strategies are more effective and on how to streamline the social media management process. Providers of social business technologies, tools and applications must provide the requisite education and training on how to properly use the social web to create and deliver profitable products to the marketplace faster and at lowered costs.